A few weeks ago, we were leaving our friend’s apartment and she offered us a few springs of fresh oregano from her garden. Obviously, I accepted. Ever since I started my little indoor herb garden, I am convinced that there is nothing more convenient and delicious than having whatever amount of fresh herbs that you need at the ready. I never grew oregano though. I didn’t think I would use it often enough to merit it a spot on my small herb table. I was very pleased to leave with my little gift and made sure to stick the sprigs in a small cup of water in the fridge to stay fresh while I decided what to do with it. That night, I went to the store to buy the reddest tomatoes, crispest cucumbers and the best goat’s feta (which we are now completely obsessed with) that I could find. If I didn’t live with an olive hater, I would have grabbed some of those too. With all of those lovely, summery ingredients, I made a simple Greek salad. It was so good that it has become a weekly staple for us ever since, which is saying something because that rarely happens around here. 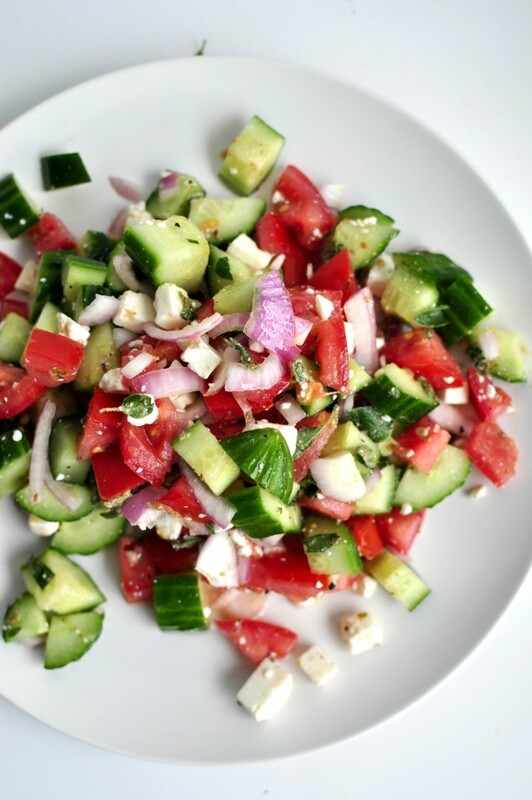 This entry was posted in Appetizer, Lunch for Work, Potluck Dishes, Salad, Side dish and tagged Easy, feta, food, greek, greek salad, greek salad recipe, Healthy, recipe, Salad, salad recipe, simple greek salad, simple recipe, simple salad, simple salad recipe on June 20, 2016 by mysecondbreakfast.